Hey friends! 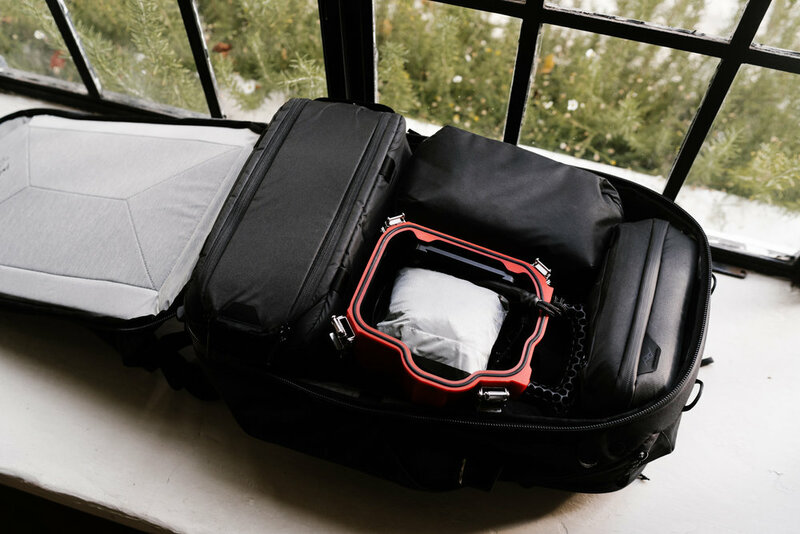 A couple months ago, I received the new Peak Design 45L Travel Backpack along with a few of the new travel accessories to use on a series of commercial travel shoots. I am not going to go too deep into the technical aspects of the bag - for that, check out the PD website for all the info. Instead, I want to show a real life overview of how I put the bag to use during 4 separate location shoots over the course of 3 weeks, and how it functioned alongside some of my other gear. Cool? Cool. Let’s get into it. Throughout October, I traveled to multiple locations in and around Chicago, Atlanta, and North Carolina to shoot a wide variety of outdoor classes and events for REI. Each day was different, but the activities included kayaking, mountain biking, rappelling, hiking, camping, and various outdoor education classes. My gear needed to be adaptable considering the wide range of needs for each particular activity, but at the same time, I needed to keep everything light and mobile. Packing for shoots like this can very quickly become a nightmare, so having a gameplan for each shoot day and knowing it ahead of time was super important in my prep. The goal was to keep my camera setup minimal, but allow for adaptability through the bags I brought along and the way I packed them out. Everything I took on these shoots was contained within the Travel Backpack and the 5L Sling, both of which I took on the plane as carry on’s. The sling acted as my main daily shoot bag, and the backpack was my hauler. All tucked away nice and neat for 7 flights total. Inside the main compartment, I was able to fit the tech pouch, wash pouch, small camera cube, medium packing cube, rain jacket, laptop, and Aquatech water housing. All the pouches and the cube were packed to the max, while the packing cube for my clothes still had a lot of room to spare (I have about 4 days worth of clothes here). Had I packed it out completely, I would have had to use the expansion zips to bring the bag to it’s 45L state. I decided to keep the internal mesh sleeve zipped up to separate the front pocket from the main compartment. You can fold down this divider to make the bag one single cavity if you wish. I didn’t put too much in the front compartment, and I definitely could have stuffed in quite a bit more. In here, I have the front glass cover to my Aquatech, my Birkenstocks in the shoe pouch, and some snacks. *Disclaimer: if you expand the bag with the zips and really pack out the front compartment, I could see there being some issues with fitting it into the overhead bin. Two of my flights had smaller than average overheads and I was still able to fit it in easily, but I did not pack it out as much as I could have. Just FYI. Packing up my gear in this way allowed me to keep my essential daily shooting gear inside the sling, while keeping the rest of my gear safe and available at the hotel to swap out as needed for each activity. KAYAKING // Most of my shoots involved either kayaking or paddling, and these proved to be the cumbersome to pack for due to the bulky waterhousing. I also had to factor in the safety of any gear or personal items left behind in the car at the trailhead, so I tried to keep everything as minimal as possible and only bring the gear I could carry out on the water with me. I used the A7III and 25mm inside the Aquatech for all of the water shoots. If I had both a kayaking and hiking shoot in one day, I would pack out the sling for the hike and leave it ready to go in the hotel (luckily my hotel was always near one shoot or the other - so swapping gear was easy). Sometimes I needed to shoot landscapes after a kayaking class, and in these cases, I would collapse the travel bag to 35L and take everything with me on the trail. It was more bag than I needed just to shoot landscapes, but the point was never leaving anything expensive behind in the rental car. RAPPELLING // Luckily, the actual rappelling gear was provided for me for this outing, allowing me to keep everything consolidated within the sling. Had this gear not been provided, I would have collapsed the Travel Backpack to 35L, and packed the necessary climbing gear inside. Side note: this wasn’t necessary on this shoot, but my new favorite way to shoot rock climbing is to have my camera on a leash and attach it to my harness with the Pro Pad and capture clip. Makes it super easy to ascend the rope while keeping the camera accessible and secure. HIKING // the most minimal of all of my setups. I attached my a7III with the 35mm to the outside of the sling via the capture clip, leaving room for the 55mm, water bottle, snacks, and personal accessories inside the sling. As you can see, everything I needed for my shoot days was always contained within the 5L sling. While I brought multiple lenses with me and a backup camera, I never needed more than 2 lenses when actually shooting. Having the small camera cube in the travel backpack allowed me to swap out the different lenses and accessories I needed on any given day, while keeping it all safe and secure throughout my travels. I had a few days off from shooting as well, and I used these days to edit at local coffee shops or shoot some landscapes around the area. In these cases, I would collapse the travel bag to 35L, and bring along my camera and laptop. I wish there was a handle more in the middle of the bag on the top. With the top handle being towards the back of the bag near the straps, it made it tough to get out of the overhead at times. The overall functionality of not only the bag, but the accessories as well, really helped me stay organized and focused on this trip. It very easily could have become a giant mess of gear, but instead I was able to pack and plan with intent. I’ve found that sticking with the entire Peak Design system of carry gear has really allowed me to keep my gear very streamlined and structured. When everything works together as a whole, there is less to worry about when planning for trips and I am able to put more of my energy towards the shoot itself. It is also worth noting that it was very easy to tuck away the waist straps and shoulder straps. In the case of emergency bag checking at the gate, this is really really important. I’ve had other bags that allow you to take the straps off, but it always takes longer than it should and is kind of a pain. Every time I boarded, I just tucked away all the straps and carried the bag on board. Also, being able to tuck away or pull out the waist straps with one hand while you are walking through the airport and the bag is still on your back was an unexpected but very welcome benefit. Overall the backpack was very functional, comfortable, and served me well. 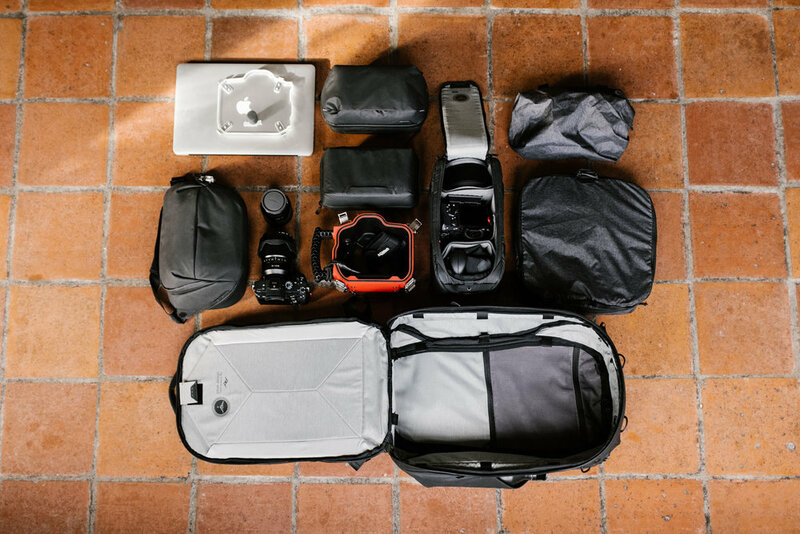 I think it fits in perfectly alongside some of the other Peak Design gear mentioned, and helps to create a completely streamlined system of carry gear for photographers who liked to stay organized. Feel free to reach out if you have any specific questions! Check out my recent interview with Shoestring Adventures here!